Our March Pic of the Vine comes under the heading of 'Be careful what you wish for.' Contributing photographer Richard Duval captured this sign of precipitation to come at Red Mountain a few days ago (that’s Col Solare in the left corner). “Red Mountain, always a favorite shooting locale of mine, often gets spectacular clouds,” Duval said. 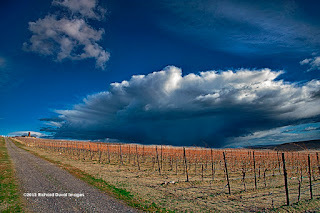 “Heading west from Walla Walla, I stopped to note a few places for summer shooting when this enormous storm cloud blew in quite suddenly from the southeast. Even with an ultra wide lens, I could barely contain all of it in a single frame." Click on the picture for a larger version of the image. Editor’s Note: For more of Duval's images, pick up the Spring issue of Washington Tasting Room Magazine where Duval penned and photographed the cover story on Whidbey Island’s wine scene. Duval also provided photos for the profile of Waterbrook.